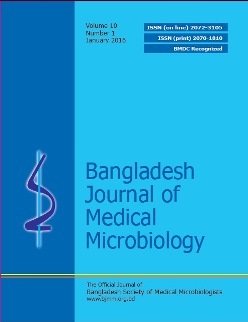 Sanjida Khondakar Setu Department of Microbiology and Immunology, Bangabandhu Sheikh Mujib Medical University, Shahbag, Dhaka. Abu Naser Ibne Sattar Department of Microbiology and Immunology, Bangabandhu Sheikh Mujib Medical University, Shahbag, Dhaka. Ahmed Abu Saleh Department of Microbiology and Immunology, Bangabandhu Sheikh Mujib Medical University, Shahbag, Dhaka. Chandan Kumar Roy Department of Microbiology and Immunology, Bangabandhu Sheikh Mujib Medical University, Shahbag, Dhaka. Mushtaque Ahmed Department of Microbiology, Popular Medical College, Dhaka. Sikder Muhammadullah Department of Nuclear Medicine, National Institute of Kidney Diseases and Urology, Dhaka. Md Humayun Kabir Department of Microbiology, National Institute of Kidney Diseases and Urology, Dhaka. Keywords: Antibiotic, Resistance, Susceptibility, Urinary tract infection, Uropathogens. Analyzing antibiotic susceptibility pattern of uropathogens help to overcome the therapeutic difficulties created by the rising antimicrobial resistant bacteria and guides in choosing appropriate antibiotics. Hence, we aimed at evaluating the pathogens causing UTI and study their antibiogram. Midstream urine samples were collected, cultured and appropriate biochemical tests were performed for proper identification of urinary pathogens in BSMMU from January 2013 to December 2013. The most common isolated Gram negative uropathogens were Escherichia coli (63.93%) followed by Klebsiella pneumoniae (17.09%), other bacterial species, named Pseudomonas spp. Enterobacter Acinetobacter spp. Citrobacter spp Proteus spp. Morganella. Among Gram positive organism S. aureus S. saprophyticus S. agalectiae and Enterococci were found. Urinary tract infections were more prevalent in women than men (61.68% vs. 38.32%). High level of sensitivity was found to imipenem, amikacin, nitrofurantoin, ceftriaxone, gentamicin, cefuroxime in most of the isolates. Almost all the test organisms exhibited multiple antibiotic resistances. The high multiple antibiotics resistance identified makes it necessary for antibiotic susceptibility testing to be conducted prior to antibiotic(s) prescription.